For the first time, a Los Angeles shelter’s Hero Dog award has gone to a cat. In May 2014, Tara the cat fought off a dog that attacked her 6-year-old owner as he rode his bicycle in the driveway of the family’s Bakersfield home. Tara body-slammed Scrappy, a chow-mix that lived next door, when the dog got out of his yard, ran for Jeremy Triantafilo, grabbed his leg and started shakin from side-to-side. Tara chased the dog toward its home. It was later euthanized. 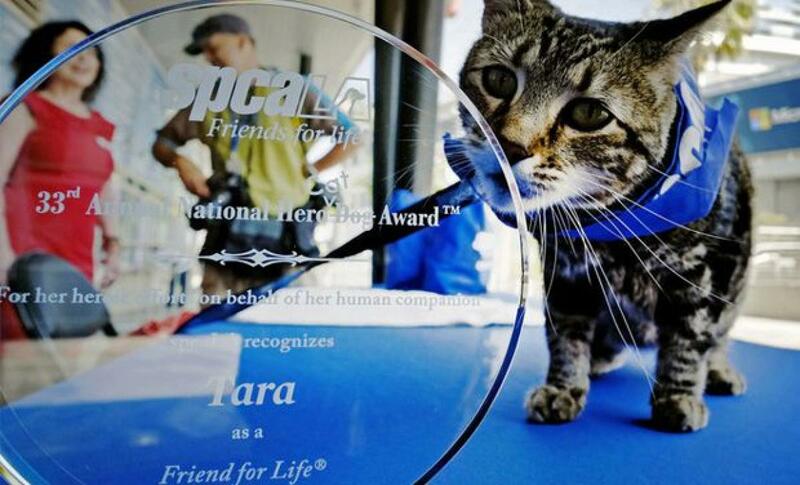 “We were so impressed by Tara’s bravery and fast action that the selection committee decided that a cat this spectacular should be the National Hero Dog,” said Madeline Bernstein, president of the Society for the Prevention of Cruelty to Animals Los Angeles. The shelter’s 33rd annual award was presented to the family in downtown Los Angeles on Friday. You will usually find Tara close to Jeremy, his father said. “The neighbor kids come over and play with her. Dogs walk by all the time. She gets along fine with our dog, Maya. But if Jeremy falls off his bike, she comes running. If he starts crying, she comes running,” Triantafilo said. He believes Tara would help Jeremy’s twin brothers, Carson and Conner, if they needed it. She’s grown up with all of them. But there is no question she is partial to Jeremy, he said. Jeremy and Tara spend a lot of time walking around and talking with one another. Footage of Tara’s heroics, from home security videos, made her an international celebrity when Triantafilo put it on YouTube. It’s gotten over 650,000 views so far. There was one alteration in the trophy: the word “Dog” was scratched out and the word “Cat” etched in.